Price per AV scanning server. McAfee’s proven, award-winning scanning technology has been extended to storage environments. Rely on always-on, up-to-date, real-time security. Decrease the risk of disseminating malicious files throughout the environment and corporate network. High availability ensures business continuity in the unlikely event of a product failure. A single product can be used to secure multiple NAS filers, thereby reducing IT cost and overhead. Multivendor support saves time and IT overhead and eliminates the need for separate point products for each vendor. Deploy McAfee ePO software to manage all of your new security solutions or leverage your current investment by adding McAfee VirusScan Enterprise Software for Storage to your McAfee ePO platform. Simplify deployment, configuration, and administration of all your McAfee solutions. Keep users and filers safe from hidden programs that open security holes and access personal information. Anti-malware software is widely recognized to be an essential component of enterprise security. And yet many corporate data centers around the world remain vulnerable. This situation results from the fact that network-attached storage (NAS), used by many organizations to store large amounts of data, is more often than not inadequately protected against malware and other security threats. To limit this exposure and ensure reliable storage security, enterprises need a high-performance, high-availability solution that supports a broad array of vendors. McAfee® VirusScan® Software for Storage can prevent malware from penetrating NAS systems and proliferating to client computers across the network and throughout the environment. More than 50 million enterprise users worldwide rely on the proven McAfee anti-malware technology for endpoint security. 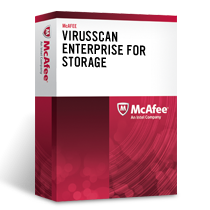 McAfee VirusScan Enterprise Software for Storage extends the proven technology of award-winning McAfee VirusScan software to the data center by providing real-time threat protection to mission-critical NAS environments. Every time a user sends a file to a shared NAS device, there is potential for proliferating virus infections and other malware throughout the storage device, the data center, and the entire network. McAfee VirusScan Enterprise Software for Storage stops malware in its tracks before it ever reaches mission-critical NAS devices. It scans files in real time when they are added or modified on the NAS device. If an infected file is detected, it is immediately quarantined, safeguarding the massive amounts of data stored in enterprise data centers. McAfee VirusScan Enterprise Software for Storage provides ultimate flexibility to accommodate a variety of storage environments and configurations. One McAfee VirusScan Enterprise Software for Storage scanner can be configured to support multiple NAS devices; or for robust failover, multiple McAfee VirusScan Enterprise Software for Storage scanners can be configured to scan a single multiterabyte storage device. McAfee VirusScan Enterprise Software for Storage is administered by McAfee ePolicy Orchestrator® (McAfee ePO™) software, the award-winning security management console that delivers a coordinated, proactive defense against malicious threats and attacks for the enterprise. With McAfee ePO software as the hub of McAfee security risk management solutions, administrators can mitigate the risk of rogue, noncompliant systems. They can also keep protection up to date, configure and enforce protection policies, and monitor security status 24/7 from one centralized, web-based console. Deploy McAfee ePO software, and manage all of your new security solutions or extend your investment in enterprise security management by adding McAfee VirusScan Enterprise Software for Storage to your existing McAfee ePO platform. With McAfee ePO software, McAfee VirusScan Enterprise Software for Storage is easy to deploy, easy to configure, and easy to manage. As a result, McAfee ePO software can be used to manage storage environments in your data center. Block malware before it makes its way to your NAS devices. Scan files in real time when they are added or modified on the NAS device. Detect infected files and quarantine them immediately to protect the large quantities of data stored in your data center. Support multiple NAS devices with one McAfee VirusScan Enterprise Software for Storage solution, or install and configure multiple McAfee VirusScan Enterprise Software for Storage scanners for robust failover on high-capacity storage devices. Supported vendors include NetApp, EMC, IBM, HP, Dell, Sun, and Hitachi. Access centralized event monitoring, reports, dashboard, and workflow through a single web-based, management console. Deploy, manage, and update agents and policies from one management platform. No learning or additional training is required for IT staff who are already using McAfee ePO software. Download the McAfee VirusScan for Storage Datasheet (PDF).